Beanie on Helina is proof positive that well-crafted, sustainable lifestyle products don't have to be dull and boring. Kaisa Erkkilä works hard to combine good quality craftsmanship with great design and usability and adds just a touch of whimsy. She uses a lot of linen in her work. 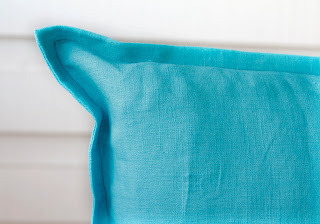 If you know this fabric, you also know that it just gets softer and more supple with every use. Her colors are a gorgeous range of neutrals with just enough color thrown in to keep things lively. 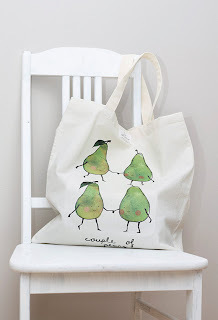 This roomy, practical tote bag will certainly brighten your day as well as help you lug those groceries home. Who says functional has to be dull and boring? The pictures of each of her items are great. You can really see the detail and quality of each of her products right along with the passion and attention to detail. One more touch of whimsy - the name! Kaisa says, "My shop name derives from a story from my childhood. When I was little girl I had a lovely pink beanie crocheted by my mom. I was quite a temperamental child and according to my dad, you could tell the mood I was in by the position of my beanie (if I was moody it was tilted, if I was happy it was on the back of my head...etc.) Also, my middle name is Helina." From her elegant designs and solid craftsmanship, her beanie is on the back of her head these days. Kaisa has a regular website with beautiful pictures of her work along with a blog, written in both Finnish and English. Both are relaxing ventures into soft tones and just a bit of fun. Such a well written and lovely piece! Thank you so much :) You have a true knack for writing!